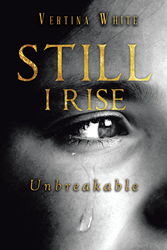 Recent release “Still I Rise: Unbreakable” from Page Publishing author Vertina White is a retelling of the author’s distressing circumstances and how she overcame them through personal conviction and will. Vertina White, a legally blind, stay-at-home mother and grandmother, has completed her new book “Still I Rise: Unbreakable”: an emotionally driven narrative of life decisions and fateful moments that reflect a well-lived and fruitful life despite the pains and inconveniences. Published by New York City-based Page Publishing, Vertina White’s impassioned memoir also mirrors a journey to finding peace and contentment in God and his promise of healing and reparation in life. Readers who wish to experience this ponderous work can purchase “Still I Rise: Unbreakable” at bookstores everywhere, or online at the Apple iTunes store, Amazon, Google Play, or Barnes and Noble.